Annika Sorenstam says she is going to have "fun" being European captain at the 2017 Solheim Cup. Vice-captain when the United States regained the trophy last year in Germany, the 45-year-old Swede said: "I can not tell you how excited I am. "I had hoped and dreamed that this opportunity would come along. This is really going to be a lot of fun." Europe will attempt to win back the trophy at Des Moines Golf Club in Iowa next August. 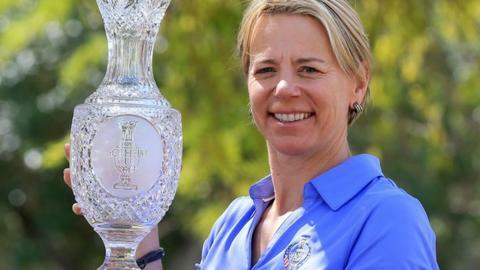 Sorenstam played on two winning sides, at Loch Lomond in 2000 and at Barseback in 2003, and was also instrumental in two victories as a vice captain in 2011 and in 2013. No player has won more matches for Europe than Sorenstam. Her record of 22 victories is equalled by England's Laura Davies, who played in nine more matches than the Swede.